Children with a rare neurological disease were recently given the chance to walk for the first time thanks to a new robotic exoskeleton. These devices – which are essentially robotic suits that give artificial movement to a user’s limbs – are set to become an increasingly common way of helping people who’ve lost the use of their legs to walk. But while today’s exoskeletons are mostly clumsy, heavy devices, new technology could make them much easier and more natural to use by creating a robotic skin. Exoskeletons have been in development since the 1960s. The first one was a bulky set of legs and claw-like gloves reminiscent of the superhero, Iron Man, designed to use hydraulic power to help industrial workers lift hundreds of kilogrammes of weight. It didn’t work, but since then other designs for both the upper and lower body have successfully been used to increase people’s strength, help teach them to use their limbs again, or even as a way to interact with computers using touch or “haptic” feedback. These devices usually consist of a chain of links and powered joints that align with the user’s own bones and joints. The links are strapped securely to the user’s limbs and when the powered joints are activated they cause their joints to flex. Control of the exoskeleton can be performed by a computer – for example if it is performing a physiotherapy routine – or by monitoring the electrical activity in the user’s muscles and then amplifying the force they are creating. But despite half a century of research, exoskeletons still aren’t widely used. This is largely because they are usually very uncomfortable to wear for long periods of time, as individuals’ bodies differ from the one-size-fits-all structure of the suits. Some exoskeletons are designed to be adjusted to fit a user’s body better, but if the robotic joints and the user’s real joints don’t rotate in exactly the same position it can produce unnatural motion, causing discomfort or pain. This is made worse by the stiffness of each part of the suit. Another problem, especially with upper-body exoskeletons, is how heavy they are, usually because of the strong materials needed to support the body weight and the powerful actuators that move the joints. Current suits also aren’t designed to cope with temperature changes or rain, which makes them difficult to use in the real world. And their appearance, which hasn’t been a primary concern of designers so far, can put people off. 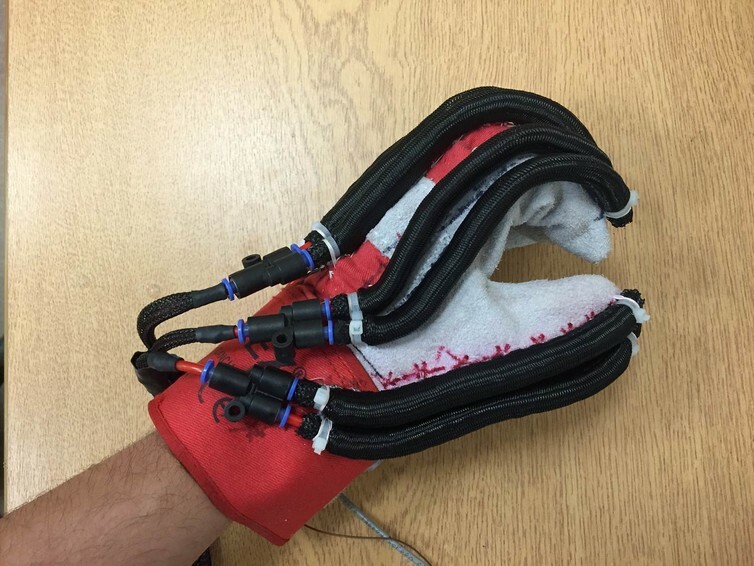 Prototype soft exoskeleton glove. Source: Steve Davis. To make exoskeletons more practical and appealing, we need innovations to make them more like a “second skin” than a giant robotic suit. Exoskeletons typically use heavy electric motors, but lightweight actuators such as pneumatic muscles are now being considered. These can produce similar forces to electric motors but at a fraction of the weight. The muscles consist of a rubber bladder surrounded by a woven sleeve. When pressurised, they increase in diameter and contract in length, pulling the joint. They are made from lightweight materials but can generate the force needed to lift many hundreds of kilogrammes. However, even these lightweight actuators still need to be attached to a rigid mechanical structure mounted to the user’s body. Myself and my colleagues at the University of Salford’s Centre for Autonomous Systems and Robotics are developing another alternative: soft robotics. This technology uses physically soft advanced materials to carry out similar tasks to traditional rigid robotic devices. They are particularly well suited to interaction with humans as they are typically lightweight which means if they collide with a person they are unlikely to cause injury. We recently developed a new “soft continuum actuator”, a joint that bends like an elephant’s trunk. Unlike a traditional rigid robot joint, if it encounters resistance in one part of its body it will still bend but at a different location elsewhere along its length. By equipping a skintight material suit with these actuators, we can create a soft exoskeleton that bends at the precise location of the wearer’s joints. This means the suit will fit a range of users comfortably without needing mechanical adjustment or calibration. Plus, the system is lightweight and can be worn like clothing rather than a bulky mechanical frame. Exoskeletons are now starting to be sold commercially and we’ll probably see more of them in the coming years. In 2012, paralysed woman Claire Lomas even completed the London Marathon wearing one. But there are still significant engineering challenges to be addressed before we will see widespread use of these systems. For one thing, we need a way for people to power the suits without having to plug themselves in every half an hour.